As more easily accessed mines are depleted, mineral exploration and extraction companies have increasingly turned to remote locations in search of natural resources. And with many of the locations so isolated that aviation is the only means for transporting materials, resources, and people, business operations are often entirely reliant on the health of a gravel runway. Without roads and railways to offer alternative transportation options, these air strips are subject to frequent use and heavy wear and tear. And when it comes to the transport of hefty cargo, aircraft can be particularly rough on runways. For companies dependent on air transport, the health and safety of a gravel runway site is not only essential to day-to-day operations, but can have an enormous impact on the bottom line, as well. If your business regularly uses gravel runways for its day-to-day operations, here are three things you should consider before choosing a runway maintenance program. During both landing and takeoff, large planes carrying heavy loads exert an immense amount of force on the surface of a runway. This deteriorates the runway over time, and more concerningly, can cause rocks to be sucked up into the engine. The subsequent repairs needed to keep aircrafts functional can be especially costly, making shoddy runway surfaces a huge liability. Aircraft that are equipped to transport massive hauls of raw material tend to be enormous. The size and weight of these planes means they require especially long stretches of runway in order to come to a complete stop — and as the gravel runway softens over time, that distance only gets longer. This can require additional site construction and costly modifications. Most distressing of all, if runway conditions become so poor that aircraft cannot take off or land, workers may become stranded in remote locations and dangerous conditions. Loosely bound gravel runways simply lose their structural integrity over time. Not only does this necessitate costly rebuilding and regrading, but it can pose a significant health hazard to site workers. Soft, loose gravel releases particulates into the air, which can be harmful when inhaled and put companies at risk of violating environmental and workplace safety regulations. Given these many complications and risks, gravel runways typically require resurfacing every five years, as well as a total reconstruction every decade. Getting all the necessary labor and materials to complete these procedures in such remote locations can be expensive — to say the least. This endless cycle of upkeep and rebuilding can drag down any enterprise’s bottom line, but a well-designed fines preservation program can cut down on the risks, resources, and costs involved in gravel runway maintenance and reconstruction. A Longer Lifespan and a Safer Runway Midwest Industrial Supply, Inc. can help you tackle this challenge head-on, saving valuable time and resources in the process. Our patented Fines Preservation solutions are specially designed to increase the lifespan of your runway, prevent health and safety risks, and cut down on endless maintenance costs. We start by first learning everything we can about your site before our team of experts develops a program tailored to your specific needs. Through the use of our highly effective, lab-developed products Envirokleen® and EK35®, we’re able to bind gravel together with market-leading strength, so runways can handle the kind of heavy loads and traffic that would otherwise cause rapid deterioration. And with fewer particulates released into the air, fugitive dust won’t pose a risk to your workers or your ability to remain environmentally compliant. 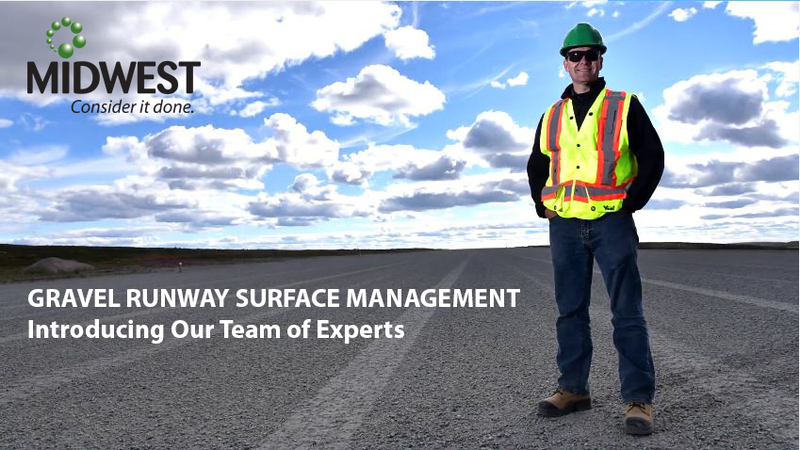 But Midwest’s customized programs aren’t simply about product application — we take a holistic approach that considers the numerous factors impacting your gravel runway’s health. Our programs are so comprehensive that we’ve been able to eliminate dust by up to 95% and double the lifespan of existing runways, all while cutting maintenance costs. If a gravel runway is essential to your business, reach out to Midwest today to learn more about a Fines Preservation program that can ensure the long-term integrity of your runway. Midwest will be exhibiting at SWIFT 2017, September 18-21, in Halifax, NS. Come chat with us at Booth #14 about how Midwest can help extend your runway life and reduce maintenance costs.